I use Google calendars a lot. I have them color-coded so I can tell things apart. Jenna created a Google calendar for the PTA and I have it color coded purple because well – it’s Jenna’s calendar so it should be purple! May and June had many purple appointments. The week after the Father and Daughter Dance was the Book Fair, four days of purple events. While the F/D Dance theme had been the 80s, the theme for the book fair was the 60s! Lisa, who organized the book fair, did an amazing job with the decorations. This was also my last opportunity to make a guest appearance as the Book Fair-ie, which is what I did on the first day. The students were wonderful and I am going to miss being the Book Fair-ie. I think I found someone to replace me next year and she will just tell the students that I retired! My legend will continue! Lisa also asked me to take family pictures the evening of Open House for posting to Facebook. What a blast! One of the Mom’s had created a VW Bus cutout to use as a prop. Don’t you love Pinterest? 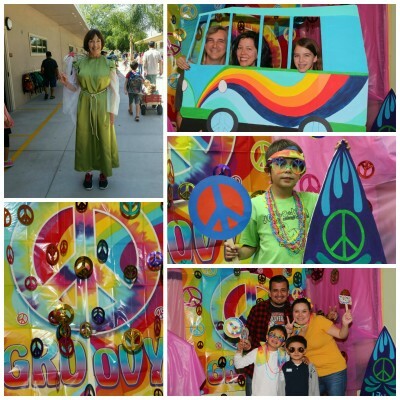 Lisa bought cute 60s backdrops and even had a table full of props like glasses, love beads and tie-dyed scarves. The kids and some of the parents really got into it! Such fun! 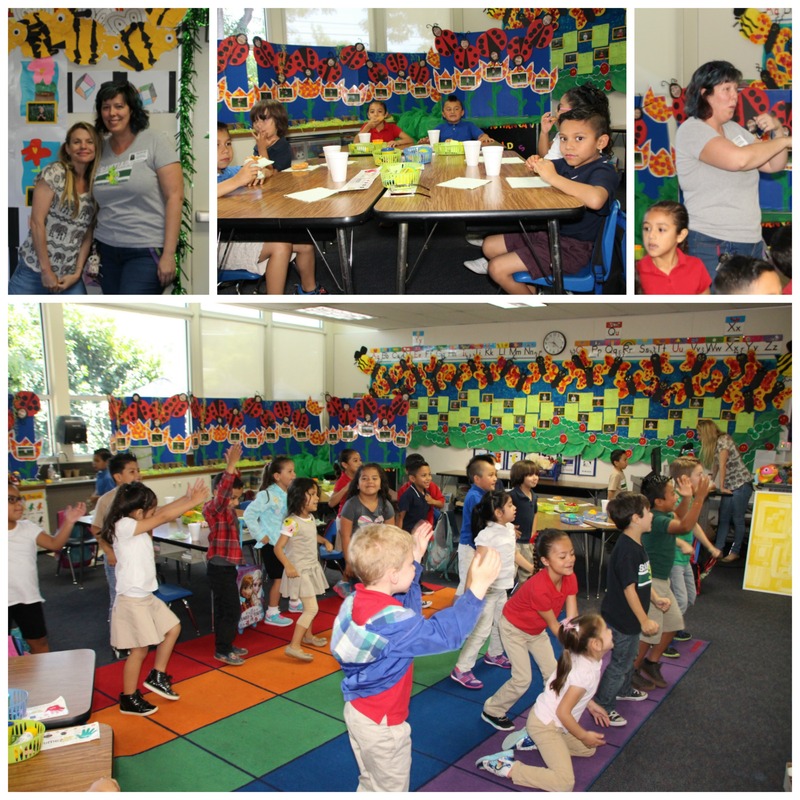 Another fun event was the Donut Party the PTA threw for the class that had brought in the most Box Tops for the entire year. I was Box Tops chair so this was my baby! We raised over $1600 this year! We had originally planned to have a pizza party but the students voted and they wanted donuts – Crispy Crème Donuts with juice and milk! They have the best teacher and she had them up and dancing as soon as they were done. 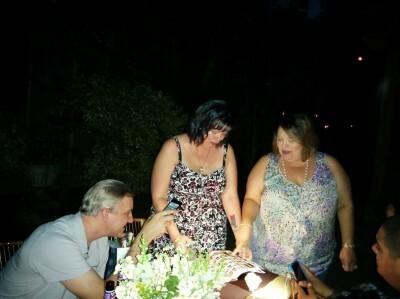 One of many fun parties. And there were lots of fun parties! 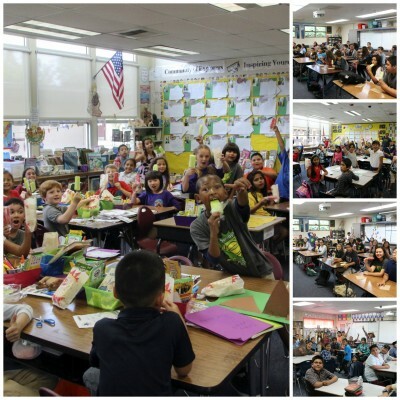 The Principal had challenged all the students to score over 75% as a class on some testing and if they did, he would treat them to either popcorn or a Paleta party! I forget how many classes made it but Jenna and I spent one entire day delivering Paletas and popping popcorn to deliver! When you come into a classroom with Paletas or Popcorn, you are very well received! It was another fun day but boy did we smell like popcorn when we got home that night. Speaking of popcorn, months ago Jenna overheard one of the teachers challenging his class to read a thousand books. She told the class if they did the PTA would give them a popcorn party. They did and we did but we also found out two other classes had done it. Seemed only fair to give them a popcorn party, too! 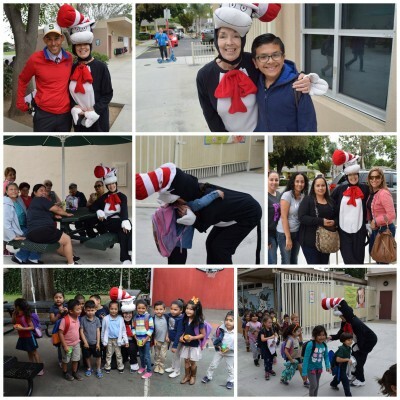 The last Monday of school, I made my last appearance as the Cat in the Hat at both drop-off and pick-up. In case you can’t tell, I really get into this and I had so much fun reminding students that they had to read their books this summer and posing with them for pictures! One little girl came up to me and said, “I know you’re not really The Cat”. I told her she was right and asked her how she knew. She tugged on a lock of my hair and said, “Your hair.” I asked her to please not tell the other students and she got the most solemn look and said, “Oh, I won’t!” Such a great day and such great memories. I will never forget any of this and I am happy to say that one of the other PTA moms will be taking over this role. She will be awesome and the kids will love it. Now have you ever wondered how many dozen Crispy Crème Donuts will fit in the back of an Equinox? Well the answer is at least 76 dozen! That is 912 donuts! I picked them up at 7 AM and I wish we had thought to take a photo. Some customer stopped and took one as we were loading! 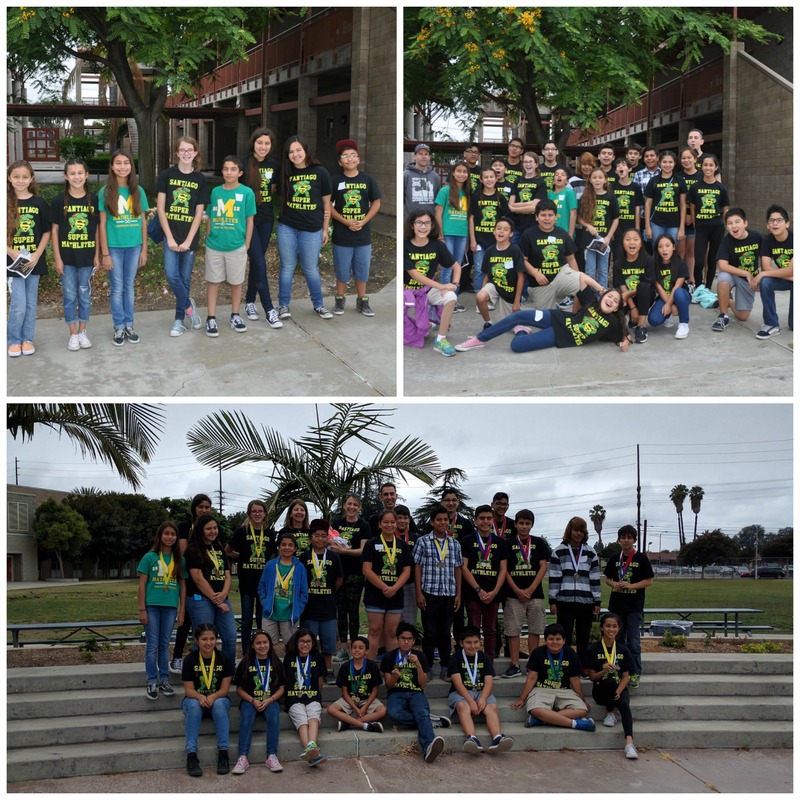 One of the other PTA events was the Honor Roll ceremony for the K-5th graders. They did them in groups and after each group received their awards, the student and their parents were treated to a donut from the PTA! We were done with that around 11:30 just in time to setup for the 8th grade Yearbook signing party. We had left over donuts, which they loved! Many of you have commented that Santiago will really miss Jenna and me. I have to tell you how they showed it! The Volunteers Tea that the staff puts on turned out to be a luncheon this year. It was great and there were a few tears especially when the Principal and 2 of the teachers presented Jenna with a huge bouquet of flowers and told her how much she would be missed! Mom pride! Then at the PTA President’s Dinner Jenna and I were both presented with bouquets made of gift cards. One of the moms had taken up a collection from all the teachers and staff. It was so nice! Jenna also received a very special gift – a 2015-2016 Yearbook signed by most of the students, teachers and administrative staff. What a cool gift! While this isn’t a purple event, Amara did leave Santiago in style! Amara did a lot of extra- curricular activities this year such as band, track and theater but J&J were extra proud of her for making the Mathletes team! She also got straight “A”s this semester. In fact, she only got one B the entire year! We are very proud of you Amara! 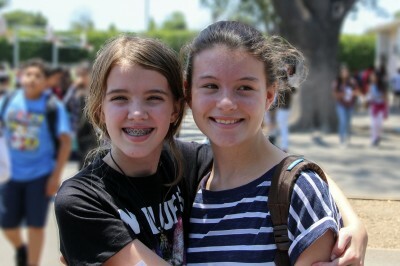 The last day of school brought many tears. Amara has gone to school with many of these students for 7 years – some since preschool and she will miss them. We will miss them, too. There won’t be any more purple calendar dates. This memory was posted in Volunteering and tagged Amara, Book Fair-ie, Cat in the Hat, Mathletes on July 5, 2016 by Grandma Kc. “There won’t be any more purple calendar dates”….I had tears in my eyes as I read, but this last line put me over the edge! Oh. My. Goodness. What a school year end packed full of exciting learning challenges and fun for the kids. And, of course, most of it would never be possible if it weren’t for volunteers. I think your names will be held in esteem for many years to come. You and Jenna set an excellent example for supporting children through the school experience. Flowers, gift cards, verbal accolades….lovely farewell gestures, but you know that none of these can really express the gratitude that staff holds for you! Somehow, I have a feeling that purple will show up again on your calendar. A new adventure. New opportunities! One thing I forgot to mention and that I am very excited about — it looks like one of the 1st grade teachers found a Grandma who just might take on the Grandparents Event! I met her and told her I would do anything I could to help her. If that happened a second year I would really feel like I made a difference! This makes me sad for you. But so happy for you and Amara and her family, too. And the new school that will get to know Amara and her amazingly helpful and creative and dependable and FUN family! I love the way you shared this, with the small bit about no more purple being such a big bit and the sign of the end. So sweet, Kc. It is certainly going to be an exciting journey for Amara! Still not sure what it will mean for me but change can be good! I really never expected to be this involved when it all began and look how it ended up! It was a wonderful experience and I just have to think something equally as fum is in the future. This brought a tear to my eye. It’s so sad yet amazing to watch our grands grow up. I love so many of your ideas. I’m going to share them with our PTA ladies. I would love to see a book fair-ie at our book fairs. I also love the challenge to read 1,000 books. I’m going to talk to one of my English teacher friends about doing that for her second grade class. I’m sure you will find a way to put some “purple days” on your calendar at Amara’s new school. It will be a shame if you don’t. I think I am struggling with Amara growing up as much as anything! How did she get to be 12 years old so quickly? DO share any of our ideas with your PTA ladies – they are welcome to contact me or Jenna. Nothing would be better than helping to bring any of this to other students! Thank you! Jenna and I are both very fortunate not to have to work 40+ hours a week like you do. That doesn’t leave you much time or energy to be involved so don’t be too hard on yourself! That was a little sad, but, in truth, that kind of involvement is so very wonderful to see. With this kind of foundation, the world of possibilities open to Amara is amazing. What a place this planet could be if every child were so very loved and nurtured. Thanks Olga! I really have enjoyed every moment of it. I am really hoping that other parents will really step up their games because of the examples we have set. Fingers crossed! How bittersweet this post was. Amara’s entire family has made such an impact on Santiago School. It’s sad that Amara won’t be a student there, but she’s going to be in another amazing school with tons of opportunities. And like you said – you never expected to be the Book Fair-ie, or The Cat in the Hat, or in charge of box tops collection. Imagine the things that are in store for you all at OCSA!! Amazing purple things for your calendar!! Love to all of you from Uncle Mark and I!!! So proud of everything you’ve all accomplished! Who knows what the future will bring any of us but it has been fun so far! Love you both! There should be a grandmother volunteer of the year award and you would be the recipient. You did such a great job at all of the events you worked at and I can only imagine how much more fun it was for Amara to have you there. The school will be talking about you for years to come. 🙂 Congrats to Amara on all of her academic and extracurricular successes this year. Thanks Judy. I have loved all of it. I really hope I got through to some of the other grandmas how much fun it is to be involved and that others will take up where we are leaving off. The folks at OCSA have no idea how lucky they are to have you three amazing ladies coming their way! Thanks Bob! A new journey for all of us. Sorry I made you hungry! I think you’re right. I do think Santiago has an amazing PTA and that it has just gotten better over the last few years. Hope it continues. Oh, I think I’m going to cry. On to new things. Yes. On to new things. Jenna and I talked today that she has to figure out how to get both of us off the calendar. I think the reminders would make it harder plus we have to leave room for those new things! Change can be bittersweet, but what wonderful memories have been made through all the years! And I imagine that the upcoming years will bring their own great times. Congratulations to Amara! Thanks Kristi! Change is always kind of scary but it will be a new and exciting journey for all of us. What an emotional experience. You have created so many wonderful memories for Amara, the school, and all of the other students. It would be so hard to stop your mind from planning all of the things you always did. So exciting for what experiences the new school year (and school) will bring. I agree, you have created so many wonderful memories for Amara and will continue to do so! You are an amazing grandmother and person. You are a legend!